I have to admit – my mother didn’t like Elvis because she was old school – she loved Eddie Fisher and Frank Sinatra and my Dad loved Polkas and Bob Wells. SOOO I did not grow up hearing many Elvis tunes. 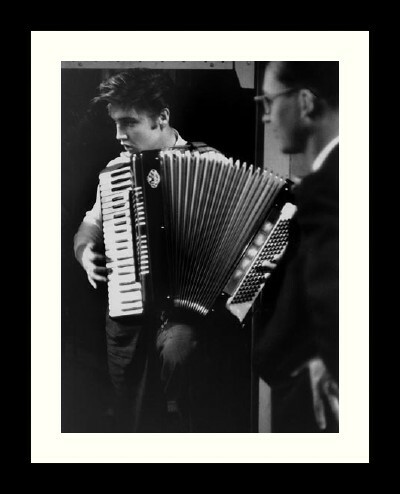 Then when I became a prof essional accordionist – I had to go and learn his tunes because that was all that I was getting requests for – and I sincerely fell in love with his voice and his style AND I saw EVERY MOVIE!!! I hate to list songs that ARE NOT ON THE ACCORDION BLOG YET – because they will catch in the search – BUT this list is getting pretty well done – so I will continue to add songs to the list as I get the written! SOO here is my list of Elvis tunes arranged in the year they were published – VIVA! ROCK N ROLL! Most fans are not aware that Elvis only won only three Grammy Awards, and those were all for Gospel recordings! How could the King of Rock & Roll not win any Grammys for his rock & roll records? One big reason is that the Grammy awards did not start until 1958. In 1956 and 1957, Elvis changed the sound of popular music and had hit after hit. If there had been Grammy Awards for those years, Elvis surely would have won a cabinet full of trophies. How could he have been denied the title for Best Vocal Performance, Male, or Best Performance By A Top 40 Artist? In 1967, he finally won a Grammy for Best Sacred Performance for the album How Great Thou Art. In 1972 Elvis won his second Grammy when his album He Touched Me took the Best Inspirational Performance award. In 1974 Elvis won this category again for his third and last Grammy. But instead of winning for a single or an album, Elvis won for the live version of the song “How Great Thou Art”. Okay Lloyd – now you made me paranoid – I had to go pull it up and I actually played it – NOO – nothing is missing!!! I did add the recap at the end though – so when you are ready to end it – just take the recap! Thanks for checking this for me. Glad you love the arrangement. I do a little walking bass line here and there too! I get so bored with plain o ump pah!!! My all time fav – I can’t help falling in love with you. Thank you very much. This was most inspiring.